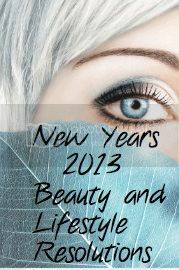 Pammy Blogs Beauty: Makeup Wars: 2013 Beauty and Lifestyle Resolutions! Makeup Wars: 2013 Beauty and Lifestyle Resolutions! Happy 2013!!! To ring in the New Year, the Makeup Wars bloggers are sharing their 2013 Beauty Resolutions! The Makeup Wars group blog blasts about the same topic about every other week. We link to each others' posts through the themed graphic and the blog logo/photo links at the bottom of this post. We encourage you readers to click the links and scroll through all of our blogs to see our favorite mascaras! Our posts all go live at the same time. So, finding out what other Makeup Wars bloggers picked is a surprise to me too! I am always so eager to click through to find out what everyone picked! Did you miss our last few Makeup Wars? Be sure to check out those posts here: Battle of the Taupes, The $20.00 Face Challenge, Battle of the Favorite Summer Lippie, the Most Expensive Face Challenge, the Best Brush, Favorite Fall Polish, Favorite Red Lipstick, Best Fall Look, Halloween Manicure, Favorite BB Creams, Favorite Mascara , Favorite Holiday Metallics, and Holiday 2012 Beauty Wishlist. Now, I couldn't just do "beauty" without throwing in a few "lifestyle" resolutions as well. For me, beauty goes way beyond makeup and skincare! In order to look and feel beautiful, I need to work on myself from the inside out. So, I included a few resolutions that are geared towards relaxing my mind and body and becoming a healthier person. From my years in the workforce as a Speech-Language Pathologist, I am not a newbie when it comes to goals setting. Not only is goal setting intertwined with speech therapy, but also it is a part of working with and leading a professional team. While my job tiled has changed from Speech-Therapist to Stay-at-Home Mommy and Beauty Blogger, I still find that goals setting is something that I do on a weekly and even (sometimes) daily basis. I know, I am so "type A"! lol! I just find that I am more efficient and productive with my time when I set goals. Plus, I just love writing lists and crossing off items as they are accomplished. I think that the key with creating attainable goals is to be realistic with goal setting. One must look at the length of time for their "data collection" and be mindful of what their goal is actually measuring. In my case, for example, rather than "lose the rest of the baby weight", I am setting goals for more attainable precursor steps like "eat healthy snacks". Also, no, I won't actually be taking data on my goals. However, I am going to make myself accountable. I am going to print myself out a copy of my numbered goals. Each day that I make advancement towards one of my goals, I will mark the # of my goal onto my refrigerator calender. With all of that said, I have not made annual resolutions in ages!!! So, I am super excited about this week's Makeup Wars Beauty Resolutions Challenge! This type of Challenge is completely fun for me! So, I am posting my 2013 New Years Resolutions! Curious? Please keep reading to find out what my Resolutions are for this brand new year! Do you see a general theme with my goals (besides "beauty")? For me, I do have a wish for 2013: I hope to carve out some more time for myself. After just becoming a Mom, and devoting so much time to my baby, I have begun to realize the importance of giving time to yourself as well. While my daughter is still my #1 priority, I know that I can be a better Mom and wife if I take care of myself too! Also, I am aiming to decrease clutter (use up those products!) and to get more organized (a total makeup collection overhaul and re-organization is in my near future...ya'll know that I will totally devote a blog post to this!). Have you created any New Years Resolutions yet for 2013? What tops your list this year? @Phyrra-I think this might have started an annual trend all over again. It was fun to ponder these! Here's what I'm bad at: everything else (except I don't do baths so I can cross that one off). Good luck on your great resolutions. Good set of goals! I could use to follow most of those myself (especially the washing makeup brushes). You have a GREAT list of goals. I love the idea of taking a bubble bath once a week. Combining that with a weekly spa night in (face mask, cleaning rushes, organizing makeup) would get a few of your goals done at once! @Teri-Thank you! :) I was thinking the same thing. I'm not even going to think about the last time I washed my brushes... 2 months ago?? I'm late posting but those are excellent resolutions. My beauty ones are to use a face masque at least once a week and moisturise my hands often. Cleaning my brushes should be on this list too; I was recently going to use a new eyeshadow colour but realised I didn't have any new or clean brushes for it. @Christine-lol, probably the same for me too!